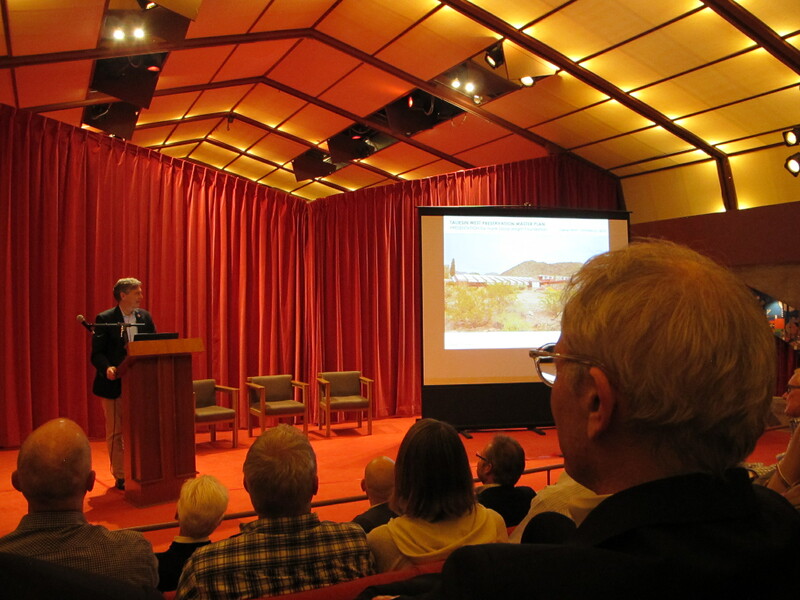 Gunny Harboe discussing the Preservation Master Plan for Taliesin West. The Frank Lloyd Wright Foundation recently released the Preservation Master Plan for Taliesin West, a National Historic Landmark, which was established in 1937 as Frank Lloyd Wright’s winter home and studio, and the campus of the Frank Lloyd Wright School of Architecture. As part of the Bruce Brooks Pfeiffer lecture series, T. Gunny Harboe, preservation architect and founder of Chicago-based Harboe Architects, and the plan’s primary author, will present the major points of the Taliesin West plan on Monday, November 16 at 6:30 p.m. at the Museum of Modern Art in New York City. The lecture is free and reservations are not required. This entry was posted in Historic preservation, Historical interpretation and tagged Caramoor, Drayton Hall, Frank Lloyd Wright Foundation, Gunny Harboe, Harboe Architects, Michael Van Valkenburgh, Taliesin West on November 16, 2015 by Max van Balgooy. Is it Time for a Membership Program Tune-up? One of the basic ways to raise funds for museums and historic sites is through membership. It’s particularly valuable because those funds are unrestricted and pay for utilities, insurance, office supplies, maintenance, and yes, even salaries–those essential expenses that usually don’t excite donors. We hope that most members will renew, thus increasing revenue while maintaining expenses, and a few will become more engaged and eventually become donors who contribute the funds that really make a difference. On the other hand, membership programs are a continual management challenge for non-profit organizations. The expense of maintaining a basic membership rarely covers the cost of administration (the printing and mailing of member newsletters, membership cards, and renewal notices). Complicating matters is that it doesn’t seem that people want to be “joiners” any longer–membership in all types of organizations, including unions, service clubs, professional associations, political parties, churches, and even bowling leagues has fallen. 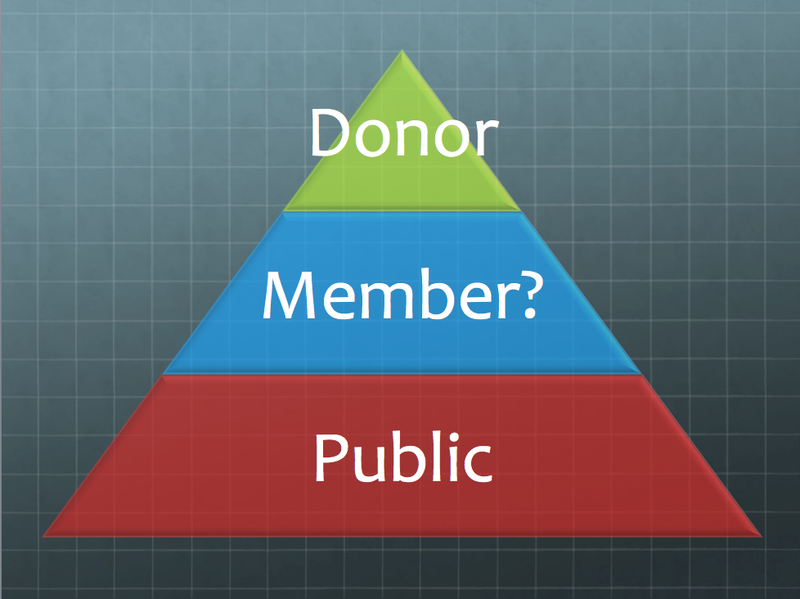 If the membership piece of the pyramid is getting smaller, that means the number of donors will fall as well. This entry was posted in Fundraising, Governance and management, Membership and tagged American Association for State and Local History, Dallas Museum of Art, Frank Lloyd Wright Foundation, Institute of Museum and Library Services on November 12, 2014 by Max van Balgooy.